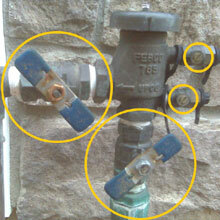 Sprinkler Startups - Mid April is usually a safe time to start up your sprinkler systems. However, you can usually fire up your sprinklers temporarily as weather allows before that time, and then do a quick shutdown if a freeze is coming. For a Do-It-Yourself guide for sprinkler startups click here. For sprinkler shutdowns click here. Weed Control - Your best defense against weeds is a good offense. Pre-emergent weed control kills weed seeds as they try to germinate, while leaving your existing garden plants live and healthy. Pre-emergents can stay effective up to 3 months after application, so they are a great way to control weeds in plant and flower beds, whether rock or mulch. These kinds of herbicides do not affect weeds that have already germinated, so if you see green you will still need to pull it! "Preen" is one of several great products available. You can find "Preen" at several garden centers, including Lowe's and Home Depot. Contact your local garden center for more information, and please read and follow all instructions on the product you use! Greening Up! - A great way to bring your lawn and garden back to life is to allow water, nutrients and air to reach the roots! Power-raking, aerating, and fertilizing are your typical ways to green up your lawn in spring. Another great way to achieve this (or in addition to this) is by adding an organic soil treatment called "Revive". Revive can be used in plant and flower beds as well as your lawn areas! You can find "Revive" at many different garden centers including Lowe's and Home Depot. Please read and follow directions on label! Spring Cleanup - Now is the time to cut back all ornamental grasses. Most perennials will need to be cut back or cleaned up. Some shrubs will need to be pruned to promote a more appealing growth habit. These may include Russian Sage, Butterfly Bush, Bluemist Spirea, Smaller Hydrangeas, Pink Flowering Almond, and some Vines. These typically can be cut back to about 8-15" above ground. A general rule of thumb with perennials or shrubs that need to be cut back is once you see new growth, cut back everything back to the new growth. The winter sun and freezing temperatures can also cause dieback on certain plants, so now is a good time to prune out dead material from these plants. Faded mulch can be stirred up, or topdressed to bring back the nice color. Weeds should be pulled, and a pre-emergent herbicide can be applied (before you see green!). Fertilize in early spring to encourage full and healthy plant growth. If you have shut down you pond for the winter, be sure to wait until all the ice in the lines has melted (usually mid April +/-), and you can start up your systems. Be sure to check your filters for proper settings and "gunk". Lighting Maintenance 101 - 1) We recommend replacing your low voltage landscape lighting bulbs immediately when they go out. Just one burnt out bulb can affect the voltage and amperage on the rest of the bulbs on the same run, and can cause a domino effect on the rest of your bulbs. Please wear protective gloves when replacing bulbs as the glass can be very sharp if broken. Most of the low voltage bulbs in landscape fixtures have wedge, or prong type bases - DO NOT TWIST when removing, as this can break the bulb and cause damage to the socket. Simply pull the bulb straight out, and replace with a similar bulb (please use similar wattage, as this can affect voltage and amperage on the rest of the lights on the same run as well!). Most bulbs can be found at your local lighting store including Lowe's and Home Depot. Keep spares on hand! 2) Power outages can adjust timers on your transformer. Since the timers only work when there is power, a simple power outage can cause your timer to lose track of time. It is a good idea to periodically check your timer for proper settings, and adjust for daylight savings, and sunset adjustments. 3) Photocells need to have a foliage free area to detect the changes from light to dark. As your plants grow, they could potentially block light from getting to your photocell. Please trim to allow for light. If you notice your lights are coming on at unusual times, please check both your timer and photocell if you have them. 4) Outdoor outlets are typically on a GFCI breaker (different from a breaker in your electrical panel - these are breakers built into an outlet just like your bathroom and kitchen outlets). These breakers can trip for many reasons including snow buildup around outdoor outlets. If you can't get your lights to work at all, please check to make sure that the GFCI breaker has not tripped (usually indicated by a light on the outlet). If it keeps tripping you may need to call an electrician. If you need additional help or information, please feel free to call us.